I started martial arts in 2000 at the age of 9 and achieved my 1st dan black belt in 2007. I have studied karate and kickboxing since the age of 9. 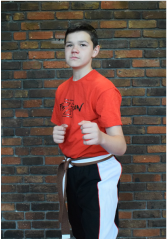 My martial arts journey has included competing which I still do and aim to start competing internationally. As an instructor I started by teaching under Jacey Cashman as an assistant which lead to my own classes being opened under supervision in Langley green and then Bewbush. As always everything constantly evolves which is when I started my own unsupervised classes in 2011 in Albert road, horley.